For the BBC radio series, see At the Beeb (radio series). 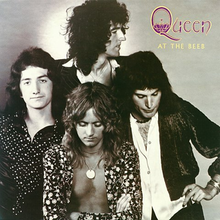 At the Beeb is a live album by the English rock band Queen, released on vinyl, cassette tape, and CD in 1989. Subsequently, it was released by Hollywood Records in 1995 in the United States and Canada under the title Queen at the BBC on CD and as limited edition picture disc vinyl. The album comprises tracks recorded in two sessions for the BBC Radio 1 Sound of the 70s programme. The first four tracks were recorded on 5 February 1973; the rest were recorded on 3 December 1973. All but one track appeared on the album Queen; the exception is "Ogre Battle" which appeared on Queen II. However, the versions featured on At the Beeb are different from the original versions, being closer to the songs as performed live. This is most notable on "Ogre Battle", as it starts right away with its riff (without any long intro), does not have any effects that the version on Queen II has and sounds much less polished. The BBC version of "Ogre Battle" did originally have a long intro featuring a grand guitar build up. It was not used for this release, allegedly because the original tape was damaged. ^ "At the Beeb". Allmusic. Retrieved 9 January 2012. ^ "Queen: Album Guide". Rolling Stone. Archived from the original on 2012-04-27. Retrieved 11 June 2012. ^ "Queen Interviews - Queen - 12-19-1989 - Queen At The BBC - The Times - Queen Archives: Freddie Mercury, Brian May, Roger Taylor, John Deacon, Interviews, Articles, Reviews". Queen Archives. 1989-12-19. Retrieved 2012-01-09. This page was last edited on 21 March 2019, at 16:31 (UTC).